Our thoughts and prayers go out to all families impacted by this tragic and senseless act of violence in our local community. A stunned Lafayette community struggles to understand why an act of horrific violence could take place in their community. Earlier that evening, a lone gunman took the lives of two people and injured nine others in a Lafayette theater. Then, minutes later the gunman took his own life with a single gunshot to the head. Plans to raise money to assist shooting victims of the July 23rd tragedy were quickly laid and put into place the very next day. 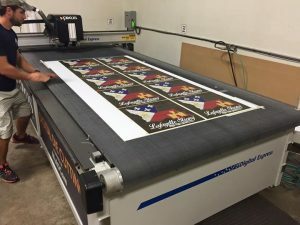 Pixus Digital Printing announced it would spearhead a fundraiser and 100% of all proceeds would go to benefit shooting victims and their immediate families. The grass roots fundraiser was officially underway printing yard signs, decals, banners and t-shirts. The Lafayette Strong logo was the idea of graphic designer Anna Gumpert, but no one anticipated the artwork becoming a symbol of courage and resolve. 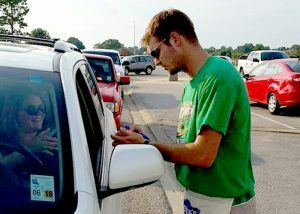 Thousands of yard signs, decals, banners and t-shirts were speedily printed as sales continued to escalate. The group’s original plan for raising funds needed to change quickly. The insatiable need for Lafayette Strong products was growing, dollars raised growing and so was local and national support. 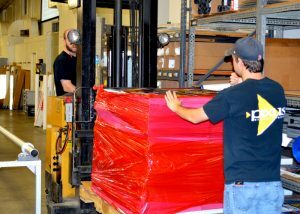 The sizable Pixus facility was not designed to handle a consistent influx of crowds, so logistics was now a major challenge. 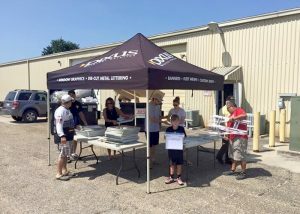 Inventory of some 500 plus signs and decals were sold in less than two hours, and a need for volunteers quickly became apparent and was posted of social media. 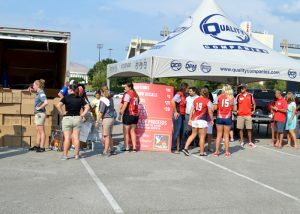 A new fundraising strategy was complete and a location was needed to host the first Lafayette Strong Drive Thru fundraiser. The location needed to be centrally located and large enough to accommodate a sizable amount of traffic. 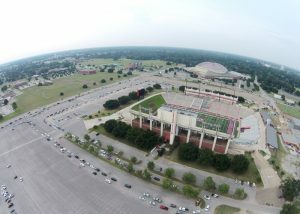 An enormous parking lot and home to the University of Louisiana’s football team was selected. 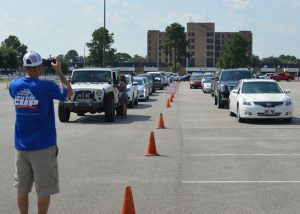 The next step would be preparing merchandise and attempting to estimate the amount of traffic that would flow through Wednesday’s event on July 29th. Invitations were sent out on Facebook and received a whopping 3,000 plus replies. 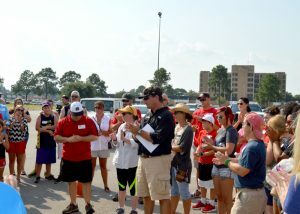 Logistics, inventory and supplies were collected and approximately 200 volunteers were ready to assist. 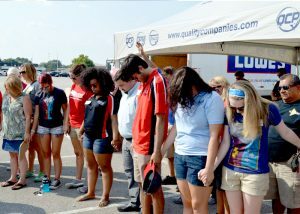 Volunteers gathered for a moment of silence and prayer. In attendance would be a close relative of one of the deceased victims of the theater shootings. “So much outpouring of compassion tonight! I mean who waits in line for hours for a sign? 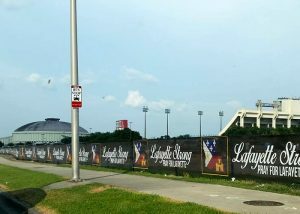 Lafayette does!” said Landry. The event’s unofficial total for 2 hours plus netted a total of eighty-eight thousand dollars for the evening, bringing purchases for a six day combined total of $121,800. 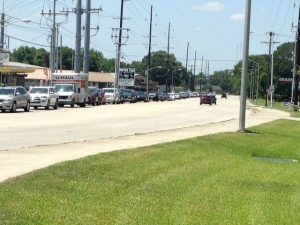 Demand for Lafayette Strong merchandise grew day by day. 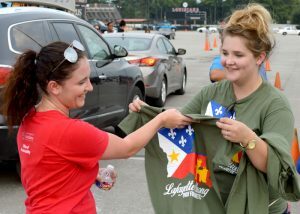 Local businesses became volunteers as retail outlets for Lafayette Strong merchandise, and 100% of all proceeds directed to victims of the theater shootings and their families. Fundraising efforts continue and have now topped $280,000. 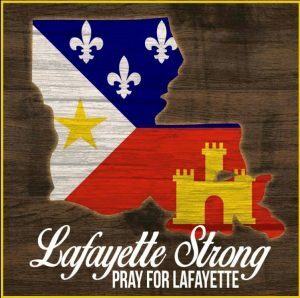 An on-line website for Lafayette Strong Donations has been created to reach out to everyone, every city, and every state affected directly or indirectly. Generous donors like you are the key to successful healing of the families of the two women killed and nine others injured. Special Thanks: Louisiana Hot Stuff, Nu Nu’s, Paul Michael’s Company, Champagne’s Spkt.